Set during the dark and dangerous build up to the Second World War, Goodnight Mister Tom follows sad William Beech, who is evacuated to the idyllic English countryside and builds a remarkable and moving friendship with the elderly recluse Tom Oakley. All seems perfect until William is devastatingly summoned by his mother back to London. Winner of the Guardian Children’s Fiction Prize and commended for the Carnegie Medal, this brand new production marks the 30th Anniversary of the publication of the novel. 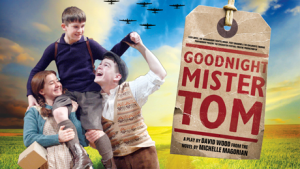 Now a world-wide literary favourite and BAFTA award-winning TV film (starring John Thaw), Goodnight Mister Tom continues to inspire audiences and bring generations together.